Charming house with large balcony. Excellent position, near the sea and the mountains. near Monte Carlo, Nice, Cannes and Italy. Spacious apartment with good equipment! 3 terraces also well equipped. Ideal for a couple or up to 4 persons. The owners are lovely, interested but nonetheless discrete. We spend a week and would have loved to stayed longer. Enjoyed the terrace with nice views and the orange marmelade and aperitif homemade by Sylvie. Thank you so much! The location is nice between La Turbie with some shops and restaurants and Peille. A lot of things to do around -with Monaco, Menton 20 min. and Nice 30 min. - Good walking and hiking - we recommend a walk from La Turbie (follow the street of the Grand Corniche towards Nice about 300 m then turn up right on the marked trail) to the Cime de la Forna- from there you go on an old road to the Fort de la Revere and back- the trip takes about 2,5-3 hours, is quite easy and provides spectacular views of the coast! The French say «hors des sentiers battus». We Americans use the phrase "off the beaten track." 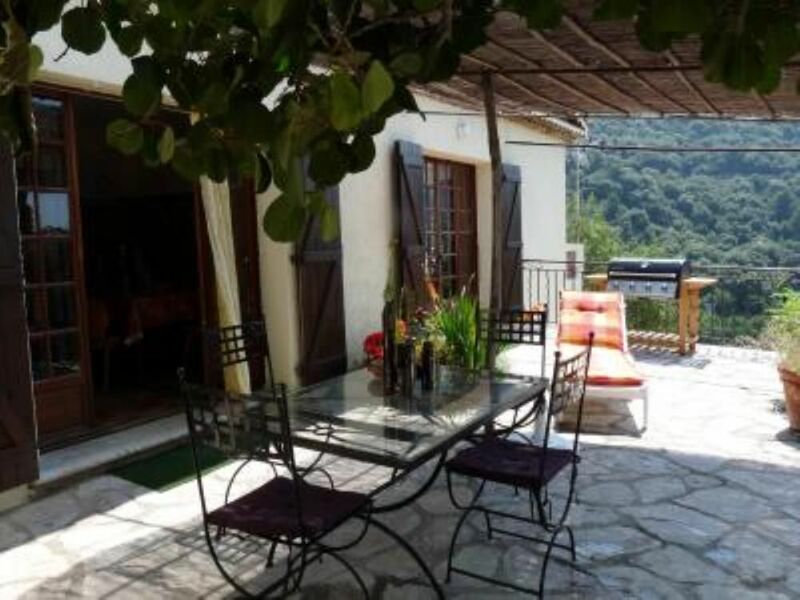 In either parlance, this lovely gîte tucked in the mountains above Monte Carlo is just far enough away from the most heavily visited sights of the Côte d’Azur to escape the hordes of tourists. But amazingly enough, it is within 40 minutes of Nice, Eze, Monte Carlo, and Menton. The house is equipped with Wi-Fi, TV, DVD, and standard conveniences plus a large deck that looks out on Mount Agel that rises up on the other side of a lovely valley. Monsieur and Madame M. are charming hosts who are always ready to assist their guests with directions and recommendations. A short walk up from the house leads to «Chez Cotton» with excellent regional specialties and wood oven pizza. The gîte,in the quartier St Martin, is about 20 km from the center of its commune, Peille, a «village perchée» where the maze of medieval lanes offers quaint scenes and plenty of opportunity to get lost. Besides the attractions of the Côte d’Azur, nearby is another medieval, perched village, Peillon where the Auberge de la Madone offers fine dining. On the way to St. Martin/Peille, one passes through the «petite ville» of Turbie with its Roman era monument to Caesar Augustus. Don’t fail to stop at La Terrasse for the food, the view, and the hospitality. "Excellent place. Ideal balance between the excitement of the coast and the tranquility of the mountains. Very good view. Great apartment, two good bedrooms, huge terrace, large and pleasant lounge, well-appointed kitchen. Close to but not within earshot of a road. Can get to La Turbie - which is lovely - by car for shops, restos, etc. in 5 minutes. Owners very friendly and helpful". Nous avons loué 3 jours pour aller à la fête des citrons à Menton, et une journée à San Remo. Location très fonctionnelle, les draps et les serviettes sont fournis, ce qui est rare en France ! Propriétaire très sympathique, disponibles pour nous conseiller. Rien à redire on reviendra ! Merci ! Nous avons été ravis d'accueillir cette famille avec qui nous avons échangé sur notre région. Nous serions très heureux de les recevoir à nouveau et les recommandons à tous les propriétaires. Das Häuschen ist wunderschön in 600 m Höhe von Grün umgeben gelegen. Ein Ort der Ruhe und Erholung - weit ab von dem bunten Treiben unten an der côte d'azur. Die netten Gastgeber haben das Haus innen und außen mit viel Liebe eingerichtet, so dass wir uns nicht wie in einem Ferienhaus gefühlt haben sondern wie in einem Haus bei Freunden. Das entspricht auch dem offenen, freundlichen, hilfsbereiten und herzlichen Verhalten von Pierre und Sylvie, die uns immer mit Rat und Tat zur Seite standen. In nur einer Stunde waren wir zu Fuß in La Turbie, mit dem Auto waren es gerade einmal 6 Minuten. Und von La Turbie starten einige schöne Wanderungen. So ist man von hier in einer guten Stunde zu Fuß in Monaco. Wir waren mit 19-jährigem Sohn und 5-jährigem Boxerhund dort. Durch das separate schöne Zimmer auf der Galerie, hatte unser Teenie seine Ruhe - und wir natürlich auch ;-). Unser "tobsüchtiger" Boxerrüde hat sich direkt in die hübsche Pepita (Hündin)von Pierre und Sylvie verliebt! Angenehm war auch, dass die Küche alle wichtigen Geräte enthielt (die auch alle funktionierten) und uns zum Kochen einiges als Vorrat zur Verfügung stand. Wir sind wunderbar erholt nach Hause gekommen und bedanken uns von Herzen bei Pierre und Sylvie für den schönen Aufenthalt. Wir freuen uns auf ein Wiedersehen. We spent one week in this nice flat in October 2018 and really enjoyed the time there. The appartment is clean and practically furnished and Pierre and Sylvie are lovely hosts who are always there if help is needed. You have got a fantastic view to the hills from the large main terrace and if you are looking for a quiet place with Monaco and Nice just a few minutes away, this is the right place to be. Thanks to Pierre and Sylvie from Dirk, Stefanie and Moyo (dog). We will come back! Easy to find, short private path to access the house. A lot of wonderful villages to discover around. Un acompte de 200 € est demandé par semaine de location, pour toute location inférieure à une semaine l'acompte sera de 50 % du montant de la location. Il n'y a pas de location inférieure à une semaine en juin juillet et août.